This is a very short walk, but ideal if you simply want an excellent viewpoint of the southern lakes without putting in much effort. As only one lane is largely followed the directions are brief. Even though the walk is very short the views are worth the stopping off before the remainder of the Lakes are explored. The walk starts on the A591 on the opposite side of the road to the railway station, behind the green railings by the pedestrian crossing. It begins by turning up the lane by a large signpost informing you that you are on the footpath to Orrest Head. It also informs you that the summit is 784 feet above sea level and that it gives unrivalled views of the Lake District Fells, Lake Windermere, Morecambe Bay and the Pennines. It also suggests that it is 20 minutes walk to the top. Once in the lane, it splits. Here take the left of the three possible routes, the lane here is still tarmac underfoot. The lane then winds its way uphill through trees before reaching a farm. The lane here now becomes rougher underfoot. Just past the farm, as the path levels, the path again splits into three. His time take the right hand path which leads up hill with a wall a few yards over to the right. In this wall there is an interesting metal gate. Continue up here, and then turn right at the top into a fenced lane. Proceed along this level lane past various benches until after a couple of hundred yards a kissing gate is reached on the left. On either side of this kissing gate are stones with engravings in memory of Arthur Heywood who donated this area to the use of the public forever. Pass through the kissing gate and climb the steps up to the summit. There is a view indicator on the summit which points out the various landmarks on the surrounding skyline. 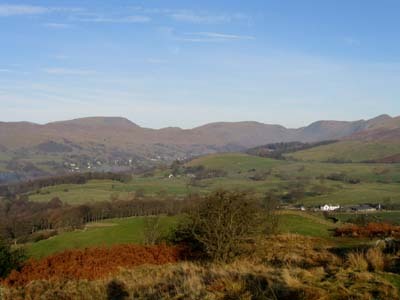 There is an excellent all round view, with the coast to the south and looking across Windermere to the West are Swirl How, Wetherlam, Crinkle Crags, Scafell Pike right around to Wansfell Pike, Red Screes, the Kirkstone Pass and Ill Bell to the North. Return now back down to the main road using the same path as that used for the journey up.